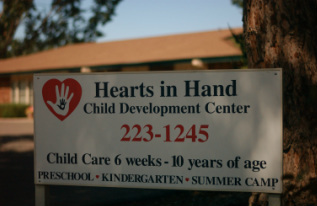 Hearts in Hand Child Development Center - Welcome Hearts in Hand Child Development Center Your best source for quality childcare and preschool in Fort Collins. Children learn by playing, by exploring their environment and by interacting with people. An atmosphere that is clean, safe, loving and stimulating is the grounds for which these experiences can best be achieved. Children, unique in their own personal development, are valued. At Hearts in Hand, each child’s racial and cultural heritage is important. The staff work in cooperation with the family to enhance these qualities. The long term goal is to give the children a quality experience equipping them with a sense of trust and respect for others and a firm foundation for future learning. The staff at Hearts in Hand is committed to showing respect to each child through a warm, encouraging and caring attitude. With low ratios, the staff can devote their time to providing a stimulating and enriched environment engaging the children in tremendous learning experiences. Hearts in Hand was established in 1994 through a partnership of staff and parents. We are licensed through the state of Colorado. Our license number is 97437.